We Knew the Left Would Oppose Any Trump SCOTUS Nominee. We Didn't Know It Would Be This Unhinged. Following President Donald Trump’s announcement that D.C. 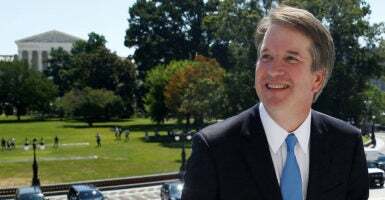 Circuit Judge Brett Kavanaugh will be his Supreme Court nominee, the left took to Twitter to air its grievances. Brett Kavanaugh's record as a judge and lawyer is clear: hostile to health care for millions, opposed to the CFPB & corporate accountability, thinks Presidents like Trump are above the law – and conservatives are confident that he would overturn Roe v. Wade. I'll be voting no. If you were ever going to grow a spine and do what this country needs you to do, now would be the time. Either this President is under the Law or he is above it. 5. Sen. Chris Murphy, D-Conn.
Brett Kavanaugh is an anti-consumer zealot, an opponent of preexisting condition protections, a critic of abortion rights and access to contraception, a Second Amendment radical, and a bad choice for the Supreme Court. Not a close call. I will vote NO. No Dem should meet w/ Kavanaugh! The McConnell rule should apply, it cannot be used for Obama only. 8. Sen. Bernie Sanders, I-Vt.
President Trump’s Supreme Court nominee Brett Kavanaugh will be a rubber-stamp for an extreme, right-wing agenda pushed by corporations and billionaires. We must mobilize the American people to defeat Trump’s right-wing, reactionary nominee. 9. House Minority Leader Nancy Pelosi, D-Calif.
10. Senate Minority Leader Chuck Schumer, D-N.Y.
What else do you need to know about Brett Kavanaugh other than he worked with Ken Starr to impeach Clinton, worked to help W win Bush v Gore Supreme Court case, and worked in both Bush White Houses. Recommended to Bush to put Alito and Roberts on the Court. He must be stopped. 19. Sen. Patty Murray, D-Wash.
A vote for President Trump’s Judge Kavanaugh is a vote to end protections for patients with pre-existing conditions and go back to the bad-old days when insurance companies were in charge & people would have to pay more, or be cut off from care, simply for being sick. Barrett was the right pick if Trump's top priority was smoothing the politics of overturning Roe. Kavanaugh was the right pick if Trump's top priority was protecting himself from criminal investigation. 24. Sen. Cory Booker, D-N.J.
26. Sen. Dianne Feinstein, D-Calif.
27. Sen. Kamala Harris, D-Calif.